Share the post "Spring Custom AuthenticationSuccessHandler Example"
In our previous post, we have created a Custom UserDetailsService that adds our own logic on how to retrieve user information. In this post, we will be creating a Custom AuthenticationSuccessHandler that will be called whenever the user successfully logged in. 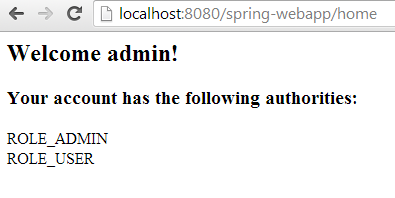 This assumes that you have already a working Spring MVC project. If not, you may want to consider reading this post on How to Create Spring MVC Project using Maven. Create a new class that will implement AuthenticationSuccessHandler. Then add your logic on how you want to handle whenever the user successfully logs in. For this example, if ever the user successfully logs in, we will add his username and his roles to its session and redirect him to the home page. //the user successfully logs in. In your applicationContext.xml, create a new bean containing our Custom AuthenticationSuccessHandler class. Next, add our custom authenticationsuccesshandler bean to our form login or create a new form login entity if you don’t have one. form login is part of the http filter. When the user logs in, it should print the username and its roles in the home page. We have created 2 hard coded users in our applicationContext.xml with their respective roles.